OCBC provides meaningful, educational and fun volunteer work for groups of colleagues, co-workers, or friends. We can accommodate up to 20 people, with prior arrangements made at least 3 weeks in advance (more notice is helpful during busier times of the year). Group visits last from 2-4 hours, and can be combined with a group bike rental for completing a Traffic Skills Intro ride or a guided tour, if desired. Days and times are flexible. We request at least three weeks’ notice (more during the summer is helpful). (optional, and rental bikes are available). We have a range of tasks to accomodate diverse volunteer groups, from easy to more stimulating. The group will get a short tour of the facility and learn about the OCBC mission. For groups of up to 15 we try to choose something from our Ten Tasks that will help process some of the many bikes we have donated, and also impart some useful bike knowledge. Tasks that can be done by larger groups range from collaborative sit-down work like sorting small parts, to large painting, building or cleaning projects. Children need to be accompanied by a legal guardian, or have this form (PDF) completed listing the adults who will be accompanying them. For most small group work a ratio of 1 adult to 3 children is needed. All groups have a tour of our facility and a brief overview of OCBC’s work, but we don’t take the group’s time for a full volunteer orientation, so in most cases group members do not clock in for shop credits, but are encouraged to return on their own to volunteer if they wish. To make arrangements for a volunteer group please email general info including group size, desired time of visit, and any special objectives, with the best time for a phone call to discuss details. Key Volunteers are vital to the co-op. This is a structured program of volunteers who choose what ways they want to help, and commit to scheduled times to help in the shop, with responsibility for many of the same tasks our staff normally handle. They provide extra assistance to all visitors to OCBC and staff. Key Volunteers all take shop classes and are trained to help shop users, retail customers, volunteers, and students. You’ll recognize them by the OCBC nametags they wear! Once trained and scheduled to cover a reasonable number of open hours, Key Volunteers receive a discount on new items (of 10% above cost) and can use the shop for their own repairs during closed hours. 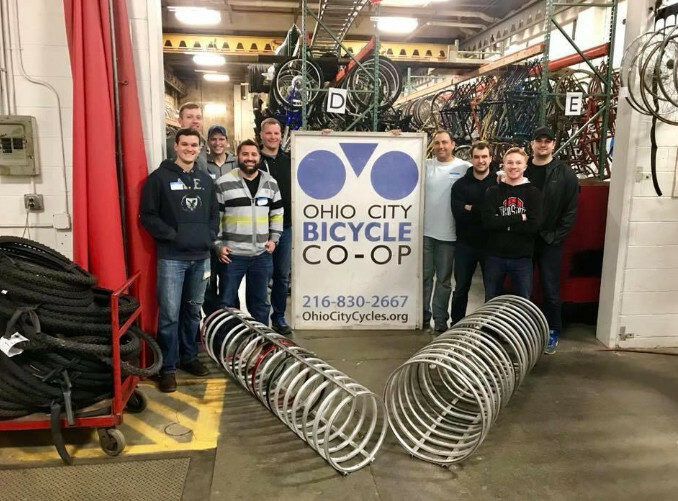 If you are interested in becoming a Key Volunteer, email the volunteer coordinator at volunteering@ohiocitycycles.org.